In all the time he has spent in bank and ATM queues, these 10 arguments were being thrown at him constantly by those supporting demonetisation, says Syed Firdaus Ashraf. 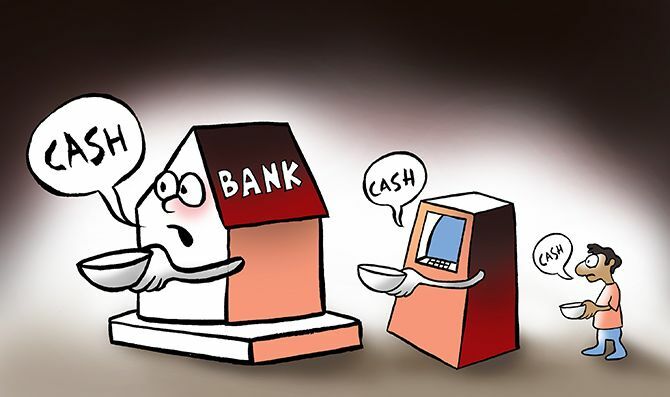 Two weeks after Prime Minister Narendra Modi announced the demonetisation of Rs 500 and Rs 1000 notes, I am tired of running from one bank to another or in search of an ATM that will spew out cash. Apart from the fatigue caused by all this physical activity, my ears are also weary. For the last fortnight all one has been hearing have been these 10 things from Modi's supporters waiting alongside me in queues at different banks and ATMs. I really admire such people who are willing to stoically bear the inconvenience caused by Modi's call for the larger good. Prime Minister, you are truly blessed because 80% of those I met agree with you on the need for demonetisation, never mind their own suffering. The PM said Indians would have to bear the brunt for 50 days, but looking at the grim ground situation, one hopes this deadline is not extended. Does it mean one will never pay a bribe to corrupt babus? Does it mean educational institutions that charge hefty capitation fees will stop the practice? Does it mean the traffic cop won't demand a bribe if you are caught jumping a signal? I hope all this happens post December 30. If not earlier. Does it mean jewelers won't accept payment in cash? Does it mean automobile showrooms won't accept cash payments to give you a discount on fancy cars? Does it mean we will never again read in newspapers that some bureaucrat was caught with crores and crores of black money stashed at home? Over 55 people, it is said, have died standing in bank queues in the last 15 days, but demonetisation's cheer leaders haven't stopped throwing this line at all and sundry. If you counter this argument, you've had it. It's possible a defamation case will be filed against you and you could even be charged with sedition, so my advice is, turn a Beethoven's ear to this argument. I am tired of hearing the Congress vice0-president being referred to as Pappu. Whoever coined the term for him has done a real disservice to all those named Pappu. Whoever is saying that should go in 2019? Airing a genuine complaint that his vision has not been properly implemented on the ground doesn't need to be countered with this argument, surely. Those who oppose demonetisation must look at scams during Congress rule, and the reference here is not just to the 10 years under the UPA. This list begins right from the jeep scam of 1948, the Mundhra scandal of the 1950s to Bofors and everything else in between till the 2G and CWG scams. Maharashtra Chief Minister Devendra Fadnavis, that's who. Point noted, Mukhya Mantriji. I support demonetisation. Now please courier my desh bhakti certificate to my home? Or shall I come over to collect it from you in person? I await your patriotic response. Clarification: I am not a member of Arvind Kejriwal's party. Were they forced to stand in queue or did they do so willingly, on their own? The answer is obvious; they chose to stand in these queues. Demonetisation forced people to stand in long bank queues. And if you can't see the difference, I suggest you see your ophthalmologist at the earliest. Very good idea, but I am late to the party. I never used plastic money before November 8, and now my situation is like Elvis Presley. The song was called, aptly, Suspicious Minds. I have no time to instigate people because I am struggling to pay for the daily services I avail of. Opposition stalwarts like Arvind Kejriwal and Mamata Banerjee may be 'instigating' people, not me. Despite everything, the hardships, even the provocations, why are people not getting instigated? "The answer is simple," one Modi supporter told me, "Political parties don't have any black money left to pay the goons for rioting."